By any measure, New York is one of the country’s top states for medical research and development: In FY11, the state attracted more than $2 billion across 4,606 awards from the National Institutes of Health. Only California and Massachusetts were better in either category. With robust academic research (not to mention a significant presence of independent research institutes, like Research!America members Cold Spring Harbor Laboratory and Masonic Medical Research Laboratory) and NYC-based pharmaceutical giants Bristol-Myers Squibb and Pfizer, bioscience pays off for New York and its residents: According to a new report, the industry directly and indirectly supported 250,000 jobs across the state and generated $309 million in state taxes and more than $5.63 billion in personal wages. But that report — “Cultivating the Next Generation of Discoveries and Development in New York Bioscience,” by The Public Policy Institute of New York State — also notes that New York can do more to support the industry. And where it draws inspiration from is no surprise: California and Massachusetts. The report cites the efforts of the Massachusetts Life Sciences Initiative; Governor Deval Patrick (D) not only funded the initiative with $1 billion over 10 years, but also provided a five-point guidance plan. The report says New York would stand to benefit from such guidance. There’s also a comparison chart that shows how each state helps science companies from startup through maturity. California is known for its entrepreneurial spirit, and the report states that the New York would benefit from more formally bringing together scientists and entrepreneurs. Aiding startups and young companies by increasing the amount of affordable incubator and lab space. The report was produced in May and released earlier in the week. 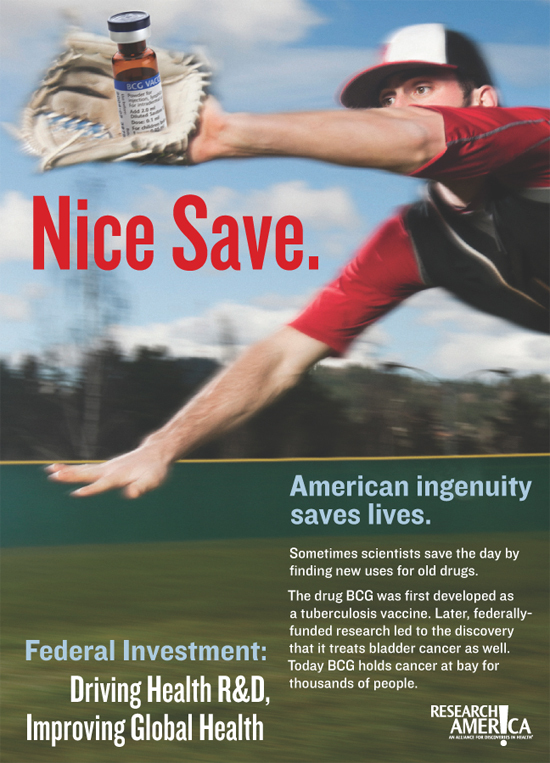 Research!America has come out with a four-part ad series titled: “Nice Save – American Ingenuity Saves Lives.” The ads began running in Politico last week and continue this week; if you live in the D.C. region and ride Metro, you’ll also see these ads appearing on the red line, starting July 9. This global health R&D awareness campaign highlights the success and (sometimes unexpected) payoffs of investing in health and global health research. Please view the ad series and learn how you can make a difference here. Research!America’s Blog has a New Home! Thanks for stopping by, and welcome to our humble new abode! After years of hosting a blog on our domain, we felt it was time to give our blog a fresh coat of paint and some new appliances. The end result is what you see here, and this will be the home of Research!America’s blog moving forward. Our old blog home will still live on as an archive, as we believe there is plenty of timeless and valuable information there. But we will no longer be adding new posts there. So please, take a look around and help us test the blinds. If you see something that’s not working as it should, please let us know by dropping an email to editor@researchamerica.org.